According to the report, annual EPC sales revenue in 2018 has hit a record high of $2.7 billion, with a 10% increase over 2017. The EPC sales are expected to grow by about 9% in 2019. Multiple factors lead to rapid growth. 4G data traffic and subscribers increase as more 2G and 3G subscribers choose to use 4G networks, and more devices such as watches, tablets, and cars access 4G networks. Subscribers using VoLTE and real-time video communication services increase, followed by deployment of LTE-based IoT networks, and promotion of 5G non-standalone (NSA) networks. Sales volume of cloudified packet core accounted for 32% of market revenue in Q4 2018, with a year-on-year increase of 108%, indicating that core network cloudification is accelerating. 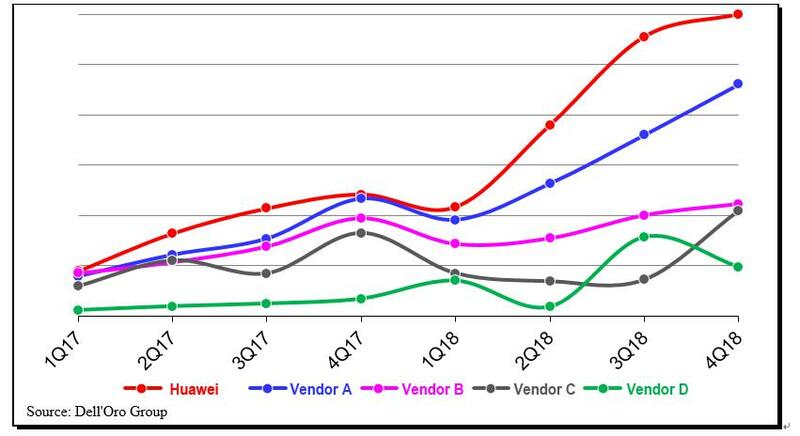 Cloudified packet core sales will reach 47% in Q4 2019, and Huawei's CloudEPC revenue ranks at the very top and is still increasing. Almost all carriers insist on using the Cloud Native architecture, including stateless VNFs and independent distributed databases. The Cloud Native architecture can enable carriers to build a reliable and elastic network to flexibly roll out new services. Carriers are more frequently asking for the use of containers for agile release of microservices. The upgraded EPC can use control and user plane separation (CUPS). The control plane and user plane of the EPC are analyzed in this report. With the expansion of 5G commercial deployments, the EPC networks using Cloud Native and distributed architecture come with increasing demands.